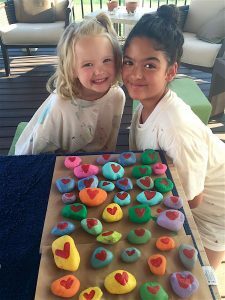 When 5-year-old Cassia Price and 10-year-old Mia Hattaway began painting rocks, they never imagined the impact it would have in both Loudoun County and overseas. What started out as a fun hobby quickly grew into a project to spread positivity and help others. Shortly after the girls began selling their hand-painted stones, the initial goal of $120 was surpassed, and they raised $1,200. Mia Hattaway poses with Deb Nekesa Kisiangani and one of Cassia’s Rocks during a visit to Kenya. But their efforts didn’t stop there. 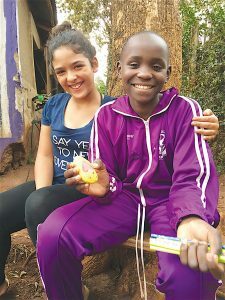 Cassia and Mia decided to use the money for a greater cause—to put Deb Nekesa Kisiangani, a 12-year-old girl in Kenya, through school. The money will finance her education until high school, something that isn’t too common in her neighborhood. 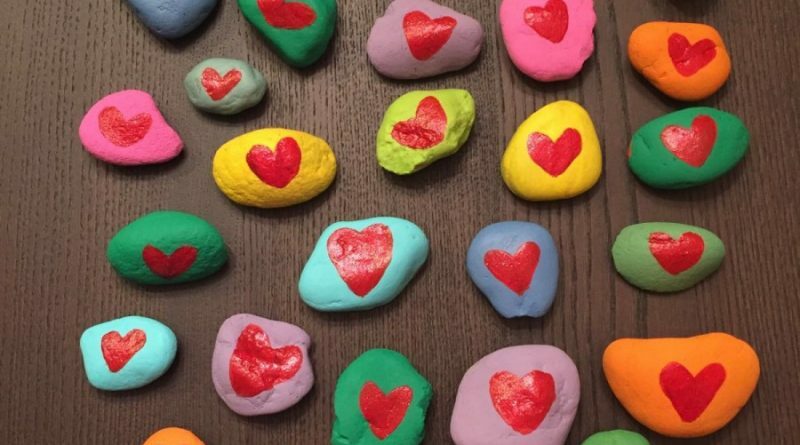 Now known as “Cassia’s Rocks,” all started when the Lucketts Elementary School student began shaping and painting hearts on rocks to place around the county for others to find. She has been doing it for over a year, with the hope of promoting smiles across Loudoun. Their self-titled Smiles to Africa Project came about when Mia and Cassia joined forces. The two bonded thanks to their mothers’ involvement with the school’s PTA, and decided they wanted to make a difference in the lives of other girls around the world. “Deb deserves to be able to go to school just like I do,” Mia said. Mia and her mother recently went to Kenya to meet Deb in person. Cassia Price, right, and Mia Hattaway display their painted rocks.